It may only be the end of March, but you may already be thinking about all of the friends and family who will be coming to visit this summer. 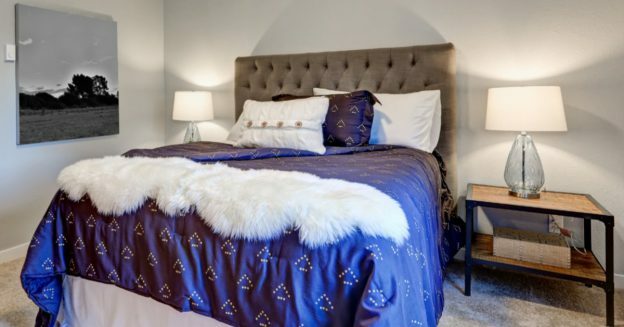 At EZ Storage® in Detroit, we’re here to help you get your house ready for visitors, particularly the guest bedroom. This space can often become a depository for random boxes, furniture, and more, since you only use it a few times a year. If you’re hoping to have the room ready by the time the first guest arrives, then visit us today to find the perfect self-storage unit. In this post, we’ll look at a few ways in which you can prepare for a summer’s worth of visitors. Your guest room likely has a bed, nightstand, dresser, and perhaps a few other pieces of furniture. They may be mismatched pieces, random choices from what you had left over after you moved into your home. If you’re hoping to move the old double or full mattress out and add a queen or king so that your guests are more comfortable, then you might need somewhere to store that old bed. The garage or basement is an option, but with the right self-storage space, you can keep the mattress clean and safe, should you need it again in the future. The same is true of any furniture you move out of the guest room — you can keep it stored until you decide to sell it, or you find another purpose for it in your house. If you’re buying a new bedroom set for the guest room, then you’ll have an ideal spot to store the old pieces of furniture. The old dresser and nightstand can be stored, and your guests will love the design and unity of the new set. The guest room closet is often where you stash random boxes of belongings, clothes that don’t fit into your closet, and anything else that doesn’t have a dedicated spot in the house. However, when guests come to visit, especially for an extended period of time, they might need some of that closet space for clothes they want to hang up and somewhere to store their suitcases. If there’s no space in the guest room closet, then consider moving some things into storage for the summer. With our monthly leases, you can rent a space for however long you need, and then take everything back home once the summer is over. Instead of trying to move boxes and tubs to another part of the house, you can keep them safe in one of our units. Summer may seem far away right now, but it will be here before you know it. If you’re hoping to have the guest room ready by the end of April or beginning of May, then come to EZ Storage® today. With one of our spaces, you can store whatever you need, and you’ll be able to rest easy, knowing everything is protected.